Puputan means “fight to the death,” and it is the monument of appreciation for the Royal family and the volunteer army who fought against Dutch army and killed at the last fighting in 1906. 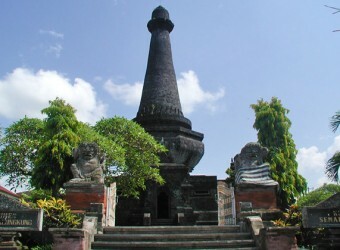 You can enter there by the entrance ticket of Semarapura (Kerta Gosa), and there is georama that shows the Royal family’s life and the fighting against Dutch army. It is a high monument, can be viewed from a distance. The location of the monument is quiet like a park. There were many local students visiting the monuments and they seemed talking something.